Tecnitas, the marine advisory arm of leading international classification and verification group Bureau Veritas, has launched a major new technology simulation system for pipeline damage assessment, in collaboration with Total. This new technology system, called EMPREINTE, allows pipeline operators to quickly determine safe operating pressures after a pipeline is damaged. It is a software suite which provides a vital decision making tool which will save operators money and cut downtime for pipeline repairs. Offshore energy pipelines can sustain all sorts of damage like dents and gouges due to external injuries, internal or external corrosion due to a corrosive effluent and failure of coating or cathodic protection, weld defects and straining due to ground movements. Operators need to know if the pipeline is safe to continue operating or if some pressure reduction or shutdown is required. EMPREINTE does that very quickly. Level 3 assessments of pipeline damage are based on advanced calculations such as finite elements. The advantage of finite element calculations is that they give a more accurate assessment of the state of the pipe and the safe operating pressure but they need usually detailed material data and are very time consuming. EMPREINTE is a pre and post processor to Abaqus finite element calculations which will perform reasonably conservative level 3 assessments in a very short time period, typically within 48 hours from defect discovery to assessment. That will typically permit pipeline use to continue when it might otherwise have needed to be shut for repairs. EMPREINTE can also be used in the design phase of the pipeline. 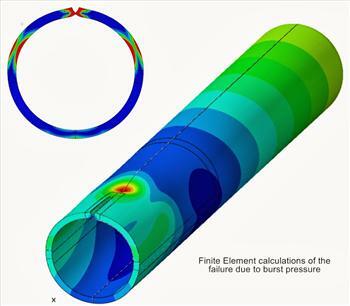 The principle of EMPREINTE, based on finite element calculations, is to use the defect pipe profile to design back a virtual tool from which the damaging process is modelled. The burst strength of the damaged pipe is determined after an iterative process to match the measured and calculated profiles. This actual burst strength is used to derive a safe operating pressure. The tool has been validated with full scale tests in various conditions. It includes criteria to capture failure by plastic collapse and by ductile fracture after significant damage development. It has been recently extended to the assessment of dents submitted to cyclic loading conditions using the Dang Van criterion.